YACHT designers and builders, when votaries of the sport, produce much better results, and in this truism we have some explanation of the success of the Scotts in the long series of yachts built during the past century. There are a few misty memories and time-worn traditions to the effect that yachting of a kind was indulged in on the Clyde in the closing years of the eighteenth century; but there are no authentic records antecedent to the nineteenth century. From 1803 onwards the Scotts have been closely identified with the pastime, and with the production in the early years of sailing yachts; and, later, of steam craft. The first notable Clyde racing yacht, of which there is any record, was launched by the Scotts in 1803, as already referred to on page 11 ante. She was a 451-ton cutter for Colonel Campbell, an Argyllshire soldier, and the launching ceremony, the honours of which were done by Lady Charlotte Campbell, was attended with military honours. For the twenty years immediately following the launch of this cutter, yachting made most pleasing progress, and in 1824 the Royal Northern Yacht Club was formed for the better organisation and encouragement of the pastime. The club had its origin in the North of Ireland, and had jurisdiction over that district, as well as over the West of Scotland up till 1838, when the Irish section was disbanded. The Royal Northern gave regattas throughout the season, at almost every suitable port, from Helensburgh on the Clyde to Oban. Amongst the leaders of the Clyde Division was John Scott, the second of the name, and a large number of the racing craft owned by the members were built by him. Indeed, one of the most experienced writers on Yachting in Scotland, Mr. J. D. Bell, says that "among the old yachting families of the West of Scotland, the Scotts and the Steeles filled the foremost place." Among the best remembered of the yachts built by John Scott were the cutters Hawk and Hope, constructed for himself, and the Clarence, built for his son- in-law, the late Robert Sinclair. The Hawk was a boat of about 30 tons, the Hope was rather smaller, and was used for cruising rather than for racing; and the Clarence was about 18 tons. 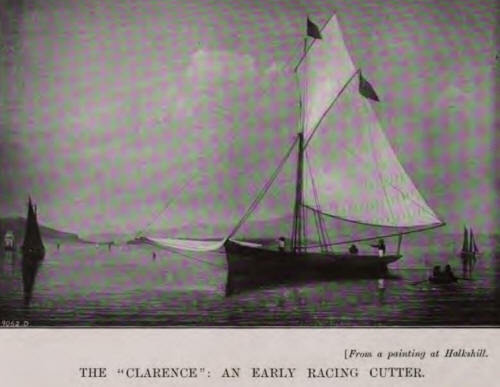 The Hawk was a successful racer, and secured many cherished prizes, but the Clarence was her superior, and was the first of a long line of prize-winners which have brought renown to the Clyde. Indeed, in all she won over thirty challenge trophies, and in her beat season never suffered defeat. Robert Sinclair, the owner, was himself a keen and accomplished yachtsman. In the races held in 1833-34—most prominent years - John Scott, with the Hawk, won the Anglesey Cup at Dublin, and the Oban and Helensburgh Cups; while Robert Sinclair, with the Clarence, won the Ladies' Cup at Oban, the Kintyre Cup at Campbeltown, the Dublin, Adelaide, and Booth Cups at Dublin, the Stewart Cup at Greenock, the Large Cup and the Dunoon Cup. These two yachts were indeed does rivals, although the principal honours rested with the Clarence. On one occasion, however, the Hawk unexpectedly defeated the Clarence in an important race at Dublin, and the owners were anxious to have the cup in Greenock as soon as possible for a special reason. Recognising that the Clarence was really the faster boat, they handed over the trophy to her crew to take to the Clyde port; but the luck which enabled the Hawk to win the cup stood by her on the passage home, and she made the port a considerable time before her rival. The Clarence became a pilot boat, and was unfortunately run down off Garroch Head, while the Hawk was transferred to the fishing trade. In later years John Scott, C.B., had the laudable desire to secure as a relic the vessel his grandfather had owned, but the negotiations failed; and the boat is probably still at work among the islands of Scotland. The Royal Northern Club's fleet in the 'thirties numbered about fifty, but there were no steam vessels on the list until 1855. Among the principal boats in the club were the Duke of Portland's ketch, the Clown, of 156 tons : the Duke of Buecleuch's cutter, the Flower of Yarrow, of 145 tons; Mr. John Scott's cutter, the Lufra, of 81 tons; Mr. Robert Meikiem's schooner, Crusader, of 126 tons; and Mr. Lewis Upton's cutter, Briton, of 91 tons. The membership was about one hundred and fifty, the aggregate tonnage of the fleet about 2000 tons, and its cost, at a fairly generous estimate, about £20,000. What a contrast is suggested by a review of the fleet of yachts owned to-day by Clyde yachtsmen! There are now eight clubs in the Firth recognised by the Yacht Racing Association, and one of the largest of these—the Royal Clyde—alone has over a thousand members, with a fleet of over three hundred and seventy yachts, of a collective tonnage of 26,000 tons, and of a first cost of a million sterling. The club-house at Hunter's Quay, which cost about £20,000, is representative of the best of its kind. Many of the yachts—sailing and steam—are of considerable size, and have international repute for their excellence, either as racers, or as comfortable seaworthy cruisers. The origin of the Royal Clyde Club in itself affords interesting suggestion of the development of the pastime on the Clyde. Owing to a rule enforced by the Royal Northern Club during the earlier period of its existence, boats smaller than 8 tons could not be enrolled; many enthusiastic owners of small craft were thus debarred from membership, and in 1856 they decided to form a new club. This, first named the Clyde Model Yacht Club, became, a year later, the Clyde Yacht Club; and, having grown immensely in influence, obtained, in 1872, Queen Victoria's sanction to the appellation of "Royal." To-day the Royal Clyde Yacht Club is one of the most important in the Kingdom. John Scott (1752-1837) was long a prominent member of the Royal Northern Club. His son, Charles Cuningham Scott, was an original member, but did not take the same active part in the pastime, the claims of a quickly-developing industry being probably the reason. But the records of the family were again revived by his sons—John Scott, C.B., Robert Sinclair Scott, and Cohn William Scott. 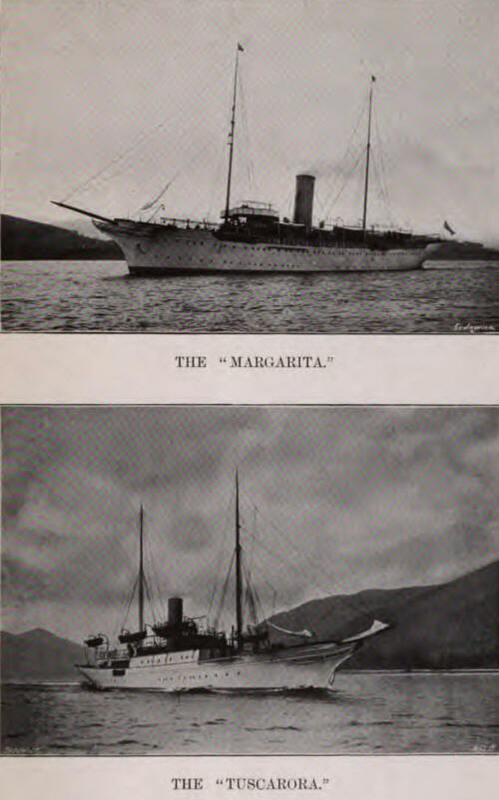 They displayed a preference for steam craft, although the first- named owned several cutters, beginning with the Zinqara; later several beautiful yachts, each successive ship being named the Greta, were built for him. The first of these, of 1876, and the last, of 1895, are illustrated on the Plate facing this page. He was elected Commodore of the Royal Clyde Club in 1895 in acknowledgment of his services to the club and to yachting generally, and he occupied the post until his death in 1904. These were exciting times in Clyde yachting. It was then that Lord Dunraven and Sir Thomas Lipton made aifr gallant but unsuccessful efforts to recover the America Cup with Clyde-built boats, while the performances of the Britannic, owned by the then Prince of Wales, now .with his Majesty the King, and of the Meteor, belonging to the German Emperor, gave a distinction to the sport which it had never enjoyed before. The Mudhook Yacht Club was formed in 1873 by a few skilled yacht designers and yachtsmen, and included Robert Sinclair Scott, Colin William Scott, and James Reid. The membership was limited to forty, and the aim of the founders was to "encourage amateur yacht sailing." There were many inspirations connected with the founding of the club; there is a tradition that when a "Mudhooker" warn being initiated, he was usually confronted with a coil of rope, a small marlinspike, a chart and dividers, a fore--castle bucket and other implements; and, before the hand of fellowship was extended to him, he was exercised, with more or less of solemnity, as to their uses. From the foundation of the Club until his death in 1905, Robert Sinclair Scott was Admiral of the Club. For twenty-nine years from the same period his brother, Colin William Scott, acted as Honorary Secretary, and his great services were recognised on the club attaining its majority in 1894, by the presentation by the members of a set of old candelabra and fruit dishes. The present Honorary Secretary is R. L. Scott, son of John Scott, C.B. 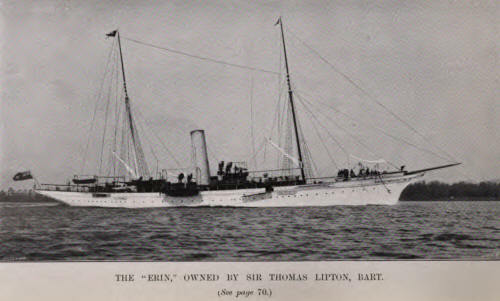 Although, as we have said, the Scotts never owned racing yachts, they have built for themselves and for others a long succession of beautiful steam yachts, as recorded in the Table on page 69. In all, seven yachts have been built in succession for the Scotts themselves. Each was named the Greta, after a small stream which runs through the Halkahill Estate, excepting the last, which was called the Grianag, the Gaelic for Greenock. The last Greta is exactly double the length of the first, while the yacht tonnage is practically eightfold. The successive steps are marked. 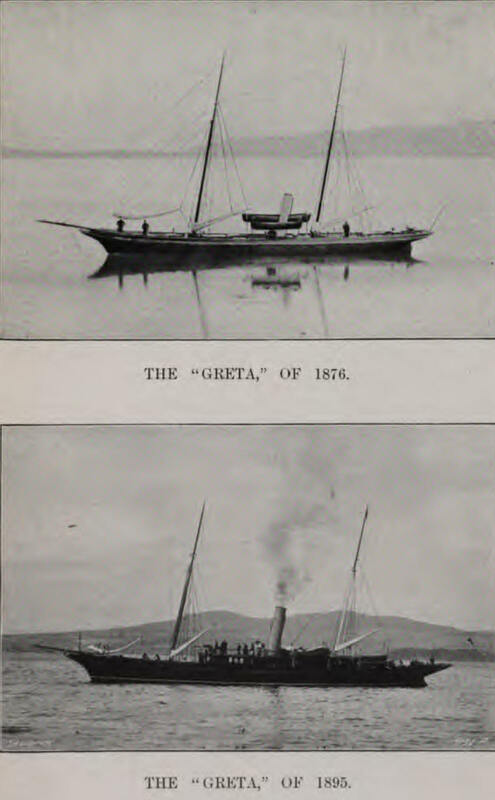 The Greta of 1876 was 76 ft. long, and of 53 tons, and she was at once purchased by a Kilmarnock lady, Miss Finnie. The vessel built for John Scott, C.B., in the following year was slightly larger, and she also was coveted and secured. In 1878 a still larger ship was built, and for many years this craft continued in the possession of its original owner, but in 1892 was displaced by a vessel of greater size, of 135 ft. 6 in. in length, and of 230 tons yacht displacement. Other vessels followed at periods of three years, and the Greta of 1898 was 154 ft. long, and of 393 tons. Many other notable vessels were constructed in the same period for other owners; and while it is not possible to refer to all of them, mention may be made of the Tuscarora, built in 1897, for William Clark, Esq., of Paisley. This vessel, which is illustrated on Plate XXIV., is 170 ft. long, and of 775 tons. She had a bridge and promenade deck 104 ft. long; and there were ten state-rooms and large saloons for the owner and his guests. Built for oversea cruising, she had a very complete installation of refrigerating machinery. The triple-expansion engines with which she was fitted developed 1030 horse-power when running at 150 revolutions, equal to a piston speed of 675 ft. per minute. Steam was supplied by a single-ended boiler. 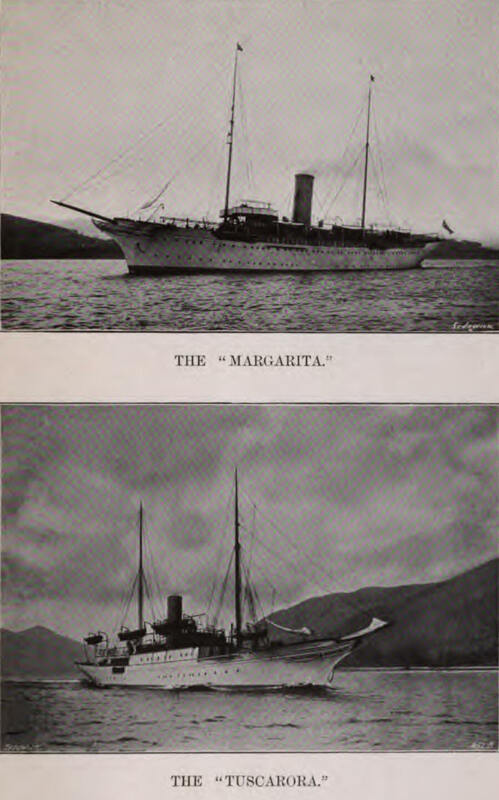 A much larger vessel—indeed, the largest of the type constructed by the firm—was the Margarita, constructed for A. J. Drexel, Esq., of Philadelphia, to the designs of the late Mr. G. L. Watson, who did so much for the advance of the science of naval architecture as applied to sailing and steam yachts. This vessel is of 272 ft. in length, with a displacement of 2522 tons. For the owner and his guests there are thirteen large state-rooms, and the general saloons include dining, drawing, and smoking rooms, a boudoir, and a children's nursery. The yacht is equipped with all the accessories of the modern liner, including refrigerating appliances. It is propelled at a speed of over 17 knots by twin-screws, operated by two independent sets of triple-expansion, four-cylinder engines, balanced to obviate vibration. 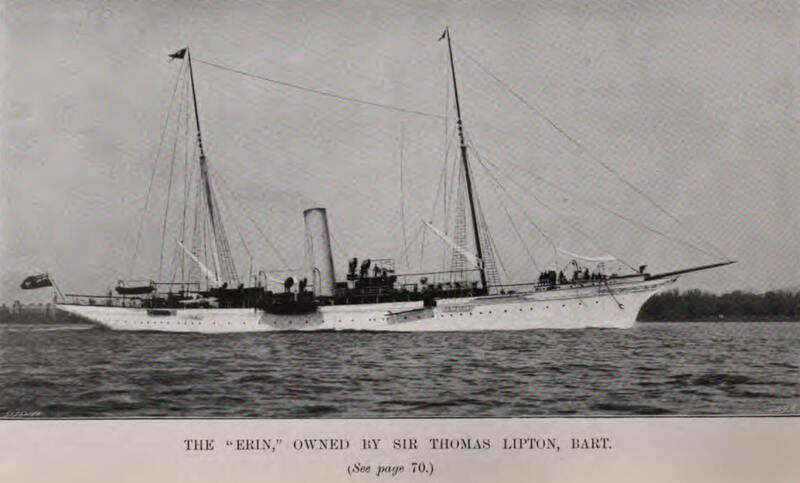 The Erin, now owned by Sir Thomas Lipton, Bart., was designed and built in 1896 for a Sicilian nobleman and was purchased later by the popular baronet and sporting yachtsman. One of the largest vessels of her time, she was 250 ft. long, and of 1330 tons displacement. The four- cylinder, carefully-balanced engines, of 2500 horse-power, gave her a sea speed of 154 knots. A view of this well-known yacht is given on Plate XXI., facing page 63. 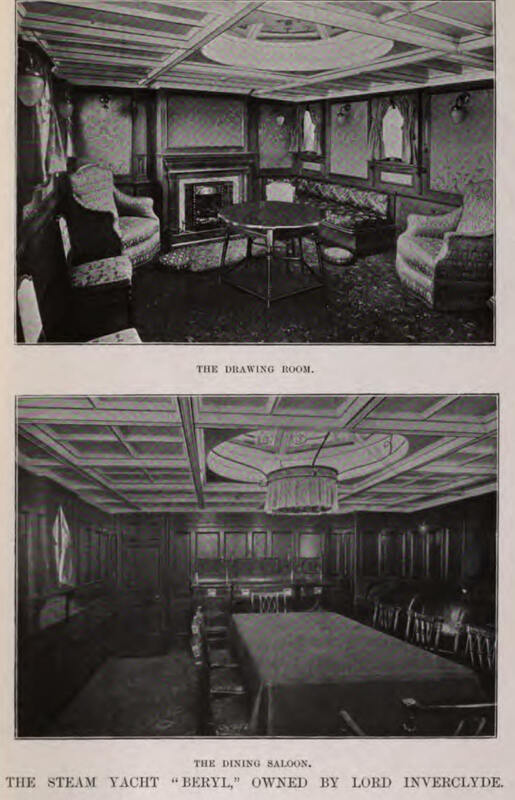 Much might be written about the decoration of these yachts; but it may suffice to give illustrations of the dining- and drawing-rooms in the steam yacht Beryl, owned by the Right Hon. Baron Inverclyde. The saloons are in the Old-English style, and are treated with decorative freedom, but with strict simplicity. The walls in both oases are framed in solid figured white Austrian wainscot oak, highly finished and polished. The drawing-room has silk tapestry panels, relieved with chaste carving on the window canopies, dado rail and mantelpiece, and divided with bevelled and carved pilasters, with carved Corinthian capitals. In the dining-room, on the other hand, there is no tapestry, the whole being of oak, suitably carved. In the ports there are large plate-glass windows, fitted with Greenwood springs. In each room there is a large cupola skylight, which, with its rich stained glass, gives a fine decorative effect. The drawing-room cupola is fitted with a brass mushroom ventilator. The ceiling in each case is of yellow pine, moulded, ribbed, and beamed in the Tudor style, and painted fiat white, picked out with gold. The drawing-room has a slow-combustion grate having bias, mounts, with richly-carved oak mantelpiece, marble Jambs, tiled hearth, and fire-brasses and fender. The dining- room has a steam radiator enclosed in a cabinet with Nuinidian marble top and brass-grilled front. The Beryl is a vessel of 160 ft. in length, with a displacement of 500 tons at slightly less than 12-ft. draught. She steams at 13.3 knots with the engines indicating 910 horse-power, steam being supplied from a large single-ended boiler with three furnaces. As typical of the engines adopted in the yachts built by the Scotts, we give an illustration on Plate XXVI., acing page 72, of the engines of the G'rianaig. In the thirty years that have elapsed since the first Greta was built, the ratio of horse-power to tonnage has increased from 1 to 1 to 2 to 1, the steam pressure from 74 lb. to 200 lb. ; and the piston speed from about 300 ft. to 675 ft. per minute. The aim has been to ensure reliability by a steady- and easy-running engine. An effective appearance has always been aimed at, and the result has invariably been a highly - finish design. Yachts' engines are invariably balanced, whether so specified or not, as the gain in comfort to all on board, owing to the absence of vibration, is so marked as to more than compensate for the extra cost involved. Forced lubrication has also been applied, although the engines may be of the ordinary open type: the main bearings, crank-pins, cross-heads, eccentrics, valve gear, pump gear, etc., are all included in the system, which has given every satisfaction. The (Jrianaig'8 engines developed on trial 740 indicated horse-power at 148 revolutions per minute, with a boiler pressure of 190 lb. per square foot, and a condenser vacuum of 26.5 in. Some of the details, being typical of the practice of the firm in respect of yacht machinery, are quoted from the specification on the next page. The arrangement of cylinders is as follows: H.P. 14 in. in diameter, I.P. 22 in. in diameter, L.P. 35 in. in diameter, Stroke 24 in. The piston and connecting-rods are of steel; the guide-shoes for the crossheads are of cast iron, the ahead face having white metal, and the astern face being left plain. The back columns are of the usual cast-iron box type, the front columns, being steel, are turned. The high-pressure cylinder has a piston valve, and the intermediate- and low-pressure cylinders fiat slide- valves. None of the cylinders is provided with liners. A single-stroke reversing engine is situated at the back of the main engine, but is operated from the starting platform. The condenser is of the surface type with a circular cast-iron shell; the total cooling surface is 1300 square feet. Steam is supplied to the main engine by one single-ended cylindrical boiler 13 ft. 9 in. in diameter by 10 ft. long, working at a pressure of 190 lb. per square inch. There are three furnaces, the mean internal diameter being 3 ft 5½ in. and the length 6 ft. 10 in. The grates are 6 ft, long, giving an aggregate area of 61.5 square feet. The boiler tubes are 3½ in. in diameter and 6 ft. 10½ in. long, the total heating surface being 1899 square feet.